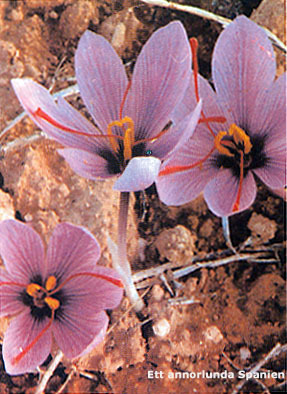 During thousands of years the saffron-crocus has been cultivated in the soils, deficient in lime, in Castilla la Mancha. The Moors began with the cultivation, later the Spaniards took over. Saffron has been used by the people around the Mediterranean from time immemorial; for it's scent, as a medical plant, and for it's unfadable characteristics. It has always been extremely expensive. Saffron is made from the flowers three pistil-marks, which contains essential oils and the yellow pigment, krocetin. To obtain 1 kg of saffron, (2,2 LB) 200.000 flowers are needed. The cultivation takes place in small fields which measures 1-12 celemines. ( 1 celemine= 382 square-yards-533 m2). Wage-earners received 1 celemine free for personal use. Often they cultivated Saffron, with the help of the family members on their spare-time, since it was profitable. In order to cultivate the crocus, you have to loosen up the soil and remove all the weeds and look out for rodents. The bulbs are set out in the early summer every fourth year. Further needed is some manure and two soaks every year, in the autumn and spring. If the autumn rain arrives as it should the harvest starts the 15th of October. "Para Santa Teresa, la Rosa en Casa". Santa Teresa is celebrated around the 15th of October and it is during that time all the flowers should be carried in the house. A a busy time starts. Everybody in the family in a position to help, harvest during three weeks. Before the dew has disappeared you pick the flowers and later all the family members gathers around the kitchen table to remove the pistil from the rest of the flower. The pistils are later roasted slowly over fire during 15 minutes until 80% of the water has disappeared. Then the pile is stuffed, weight and valorized. The Spanish production of saffron is however reducing rapidly. It's not worth the effort any more. The draft has influenced, but the worst thing is the growing competition above all from Iran, who is reducing the prices a lot less then a farmer from the EU can accept. He needs at least 100.000 pesetas per kilo but is offered 70.000. Meanwhile Iran exports for 45.000. Less good quality, but still! What can be done to change this? The only way is to modernize the ancient way of doing business, says the people of Consuegra. Help with irrigation, production of better plants, and a continued development of quality control are some requirements, some of them already implemented. While waiting for better times one can amuse oneself by participate in the "Fiesta de la Rosa del Azafrán". The big Saffron Party in Consuegra is organized every year in the end of October, since it was established more then 30 years ago by Francisco Dominguez Tendero, the town's intellectual leader and the celebrations "pregonero". (The person who proclaims the celebration). At this place "Crocus-pickers" from far and near come to compete who is picking fastest. They choose a Queen of Saffron among the young girls in the neighborhood. Maybe, the zarzuela "La Rosa del Azafrán", by Jacinto Guerrero is performed. You are offered music, dance and fireworks. Also, one of the famous windmills, "Sancho", grind flour for "peace in the world". This is the only time of the year that Sancho is being used.